J. C. ignited my (very healthy) obsession in quantum computing about half a year ago. In the past few months, I have read some technical materials, but have been craving for more and more about the origin and the development of quantum physics, and the giants behind it. Sadly Richard Feynman’s books are still in one of many unlabelled boxes of books. I have not had the right frame of mind to open and sort them. My profound dislike of shopping means that I still do not have proper bookshelves after giving away my old shelves during our last move. Indeed I am terribly lazy in some parts of life and I am not ashamed of that. In the blissful absence of the books I own, I went further back to Max Planck and Erwin Schrödinger who originated and contributed substantially to quantum theory. This Memorial Day weekend blessed me with Max Planck’s wonderful company through Brandon R. Brown’s book: Planck – Driven by Vision, Broken by War. I have long had a very warm impression of Max Planck thanks to the fact that a few wonderful friends of mine did their doctoral studies in Max Planck Institutes in Germany and spoke highly of their time there. Besides that and Planck’s fame as a very influential theoretical physicist, I did not know much about him at all before reading this book. It goes without saying that the book discusses Planck’s achievements in the theoretical physics world, recognising and mentoring the very gifted (such as Albert Einstein and Lise Meitner) who might otherwise have been neglected by the masses. Meitner remained a lifelong friend of Planck and his family. Although Planck admitted Meitner to his lectures when women were typically barred from Prussian universities at that time and later tirelessly advocated for her over decades, Planck’s views on academic women were rather following the mainstream at the time: in general it can not be emphasized strongly enough that Nature itself has designated for woman her vocation as mother and housewife, and that under no circumstances can natural laws be ignored without grave damage. Most of the correspondences quoted in the book probably are translated to English from German. If so, the English translations are of the finest quality, in my opinion. In his late years, Planck recollected his childhood to a cousin: days and weeks that not only stay in our thoughts but grow in glory… as we become conscious of the incredible good luck that surrounded us, and how deeply greatly we must be for what we took for granted then. When being told that physics was nearing its natural conclusion and there was nothing left to do (thanks to the success of Isaac Newton’s mechanics, James Clerk Maxwell’s electricity and magnetism, and the new and nearly complete field of thermodynamics), by Professor Philipp von Jolly, Planck said that he did not mind if his life’s work would be largely an end in itself, for further and deep edification. Many kinds of men devote themselves to Science, and not all for the sake of Science herself. There are some who come into her temple because it offers them the opportunity to display their particular talents. To this class of men science is a kind of sport in the practice of which they exult, just as an athlete exults in the exercise of his muscular prowess. There is another class of men who come into the temple to make an offering of their brain pulp in the hope of securing a profitable return. There men are scientists only by the chance of some circumstance which offered itself when making a choice of career. If the attending circumstance had been different they might have become politicians or captains of business. Should an angel of God descend and drive from the Temple of Science all those who belong to the categories I have mentioned, I fear the temple would be nearly emptied. But a few worshippers would still remain – some from former times and some from ours. To these latter belongs our Planck. And that is why we love him. ….His gaze was fixed on the eternal things, and yet he took an active part in all that was human and he lived in the temporal sphere. How different and better the human world would be if there were more such unique people among the leaders…. 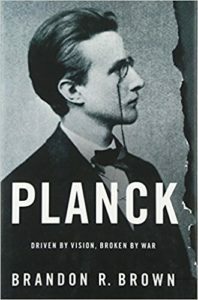 Planck lived through Second Schleswig War, the First and Second World Wars, lost beloved family members to illness, war, and to execution, and lost his home to allied bombing. His optimism as reflected through his writings persisted. In fact, his lifelong motto was “one must be an optimist”. A great amount of content in this book shows me the catastrophic impact of the WWII on the prominent scientists in Germany. I cannot help wondering what if Planck’s notes and journals were not destroyed by the war, how much more we would know of the man. For it is just this striving forward that brings us to the fruits which are always falling into our hands and which are the unfailing sign that we are on the right road and that we are ever and ever drawing nearer to our journey’s end. But that journey’s end will never be reached, because it is always the still far thing that glimmers in the distance and is unattainable. It is not the possession of truth, but the success which attends the seeking after it, that enriches the seeker and brings happiness to him.